Interesting photo. This was taken last year in New York at Tony Bennett's 80th birthday party. 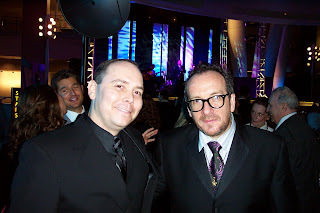 Sure, Martin looks a little pasty there in the bright lights next to Mr. Elvis Costello. He's a huge fan of his Spike album -- says it's the track diversity and the intimate writing blah blah blah. So, we were both shocked when we were offered a few CDs to give away for this specific podcast.